Support for Pallaskenry & Bleach Lough Spring Water Retention Group. 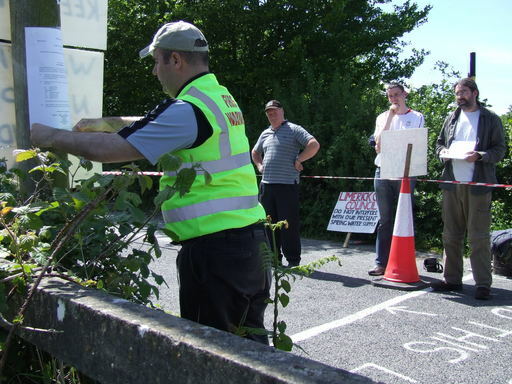 limerick | environment | news report Monday June 05, 2006 22:55 by Niall Harnett - Rossport Solidarity Camp / Gluaiseacht. 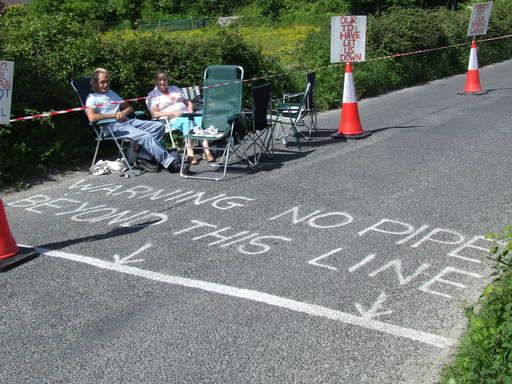 Point of contact for those preparing to travel to Pallaskenry, Co Limerick in anticipation of tomorrow’s expected assault by Limerick County Council. 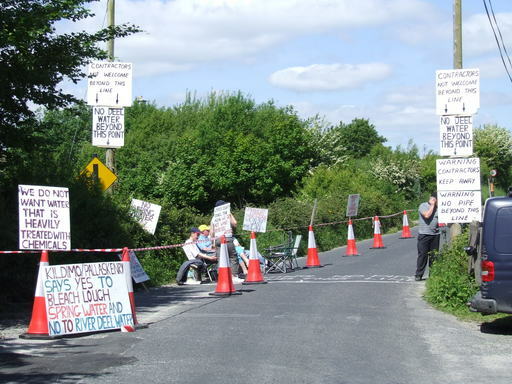 The Bleach Lough Spring Water Retention Group want to stay connected to the lake which has provided them with spring water for more than 50 years. Limerick Co Council want to divert them to a water supply from the polluted River Deel. Last Thursday 1st June, Limerick Co. Council obtained a high court injunction against 7 local residents who have drawn a line in the road and are blocking this ‘new’ pipeline from crossing that line and coming any further. They will continue to walk the line from tomorrow Tuesday 6th June, when Co Council workers are expected to try and force their way through using the threat of this injunction. 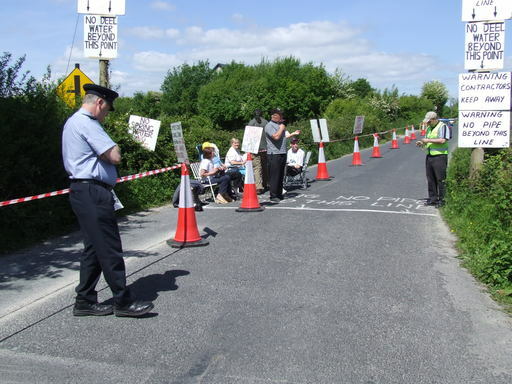 Following a meeting last night at the Rossport Solidarity Camp Gathering to discuss this issue and to garner some support for the Pallaskenry group, some volunteers from Limerick and elsewhere around the country including Micheál O’Seighin of the Rossport Five have offered to be there to ‘walk the line’ in support of local residents opposing this polluted River Deel water pipeline. Dedicated local campaigner, builder and farmer Donal O’Brien, has offered to facilitate anyone travelling to Pallaskenry and can help to provide beds for anyone who comes. There is also space available on nearby lands for anyone wanting to camp. Spring water versus polluted water. It’s a no-brainer folks! The question is … Who benefits?… We know who’s earmarked for the polluted stuff. But, with all the industry in the area crying out for clean water, who is ear-marked for the spring water? Suspicion abounds and these are serious questions that need to be answered. Head for Pallaskenry for between 8am and 9am. N69 out of Limerick through Kildimo, second turn right after Kildimo for Pallaskenry, drive straight on to meet ‘the white line’. Ring Donal at 087 2534986 to find a place to stay or camp. He’s waiting for your calls! in 'protecting and serving the community'?! 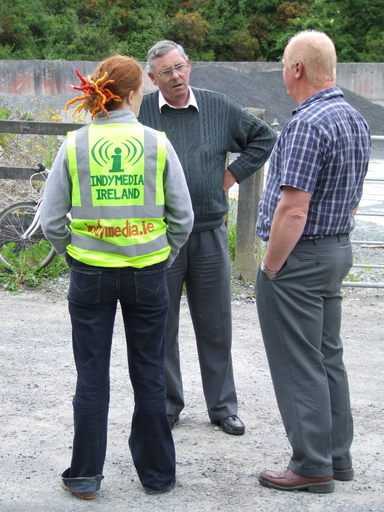 Locals turned on to Indymedia now.